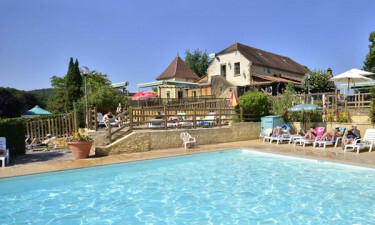 Immerse yourself in glories of southwestern France at Les Grotte de Roffy luxury camping site. In this pet- and family-friendly Lux-camp site located in the Dordogne-Périgord area, the intent is to seamlessly mesh the rustic character of the Dordogne region with all the amenities of modern camping luxury. The heady scent of summer blooms along the winding lanes and the golden-coloured stone of the traditional architecture re-create the tranquility of an 18th-century Périgord village. The accommodations are 2- or 3-room mobile homes each set at a different height amongst shady trees in order to maintain a private, natural setting. All mobile homes, the larger of which are suitable for up to 6 people, open at the front into a veranda with chairs — perfect for your first café-au-lait of the morning or a glass of the regional wine in the cool evening. Established in 1975, this luxury camping site is Wi-Fi’ed throughout and all facilities are open from mid-April to mid-September. During July and August, concerts, shows, and children’s sports events entertain the young and the old alike. The English-speaking staff at the reception centre will provide you with tourist information regarding hiking, canoeing, cycling, and walking in the area. Why should I bring my family to Les Grottes de Roffy on a camping holiday? 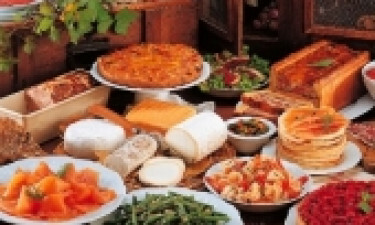 For the sensory extravaganza that is the typical French market, take the shuttle bus 6 km from Les Grotte de Roffy campsite directly to the Sarlat Saturday market. Minus the tourists, you might think that Sarlat has been bypassed by modern history. Due to the impeccable restoration of the buildings, the 14th-century centre of the town has been used for Hollywood films. Architectural attractions include a visit to Cathédrale St-Sacerdos, originally built in 1100s, and Eglise Ste-Marie with a panoramic lift that provides a 360-degree vista of the surrounding countryside. The Périgord-Noir area is noted for black truffles, cepes, chestnuts, walnuts, strawberries, cabecou goat cheeses, and wine. The onsite restaurant makes a fetish of using only locally-produced ingredients, which, luckily, are plentiful. In addition to the onsite sports facilities, Périgord-Noir’s outstanding scenery is easily accessible from the luxury camping site of Les Grottes de Roffy. For a family-oriented activity, consider viewing the Dordogne Valley from the vantage point of a kayak or canoe on a guided day trip or overnighter. The Voie Verte et Veloroute is an old railway line that has been converted into a bicycling path that is relatively flat and easy enough for children. The path passes through forested areas and countryside, offering glimpses the Dordogne River, and through a quarter-mile tunnel.